If you don't drive down Yonge Street in #Toronto I have an event for you; Celebrate Yonge. It also might slow down TTC buses so keep to the subway. 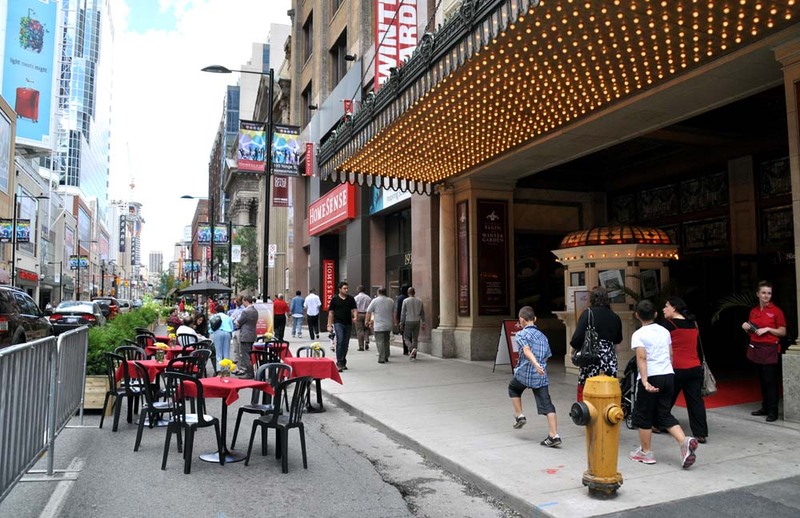 The month long pedestrian friendly celebration will provide plenty of elbow room as two of the four lanes are closed off to vehicles and filled with planters, patios and 11 themed event areas: Gateway, Oasis, Funway, Main Street, Atrium Hot Spot, Gallery, Hub, Centre Stage, Green Room, Red Carpet and as a bonus the Toronto Eaton Centre. 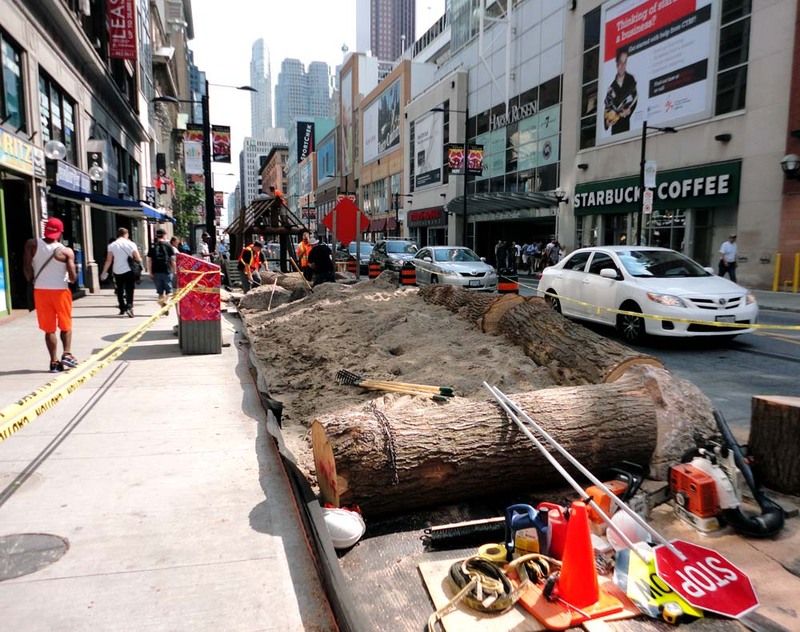 The lanes between Queen Street and Gerrard Street, with Dundas Street in the centre, have been marked and workers are already busy installing the barriers and planters for the Friday August 17 opening and on through to September 16, 2012. 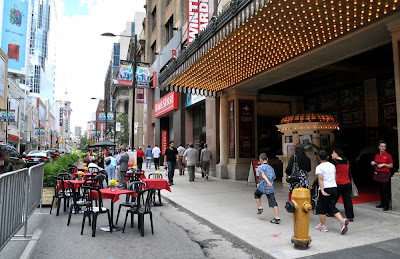 We can always use some licensed patios, promotions and art installations in the heart of downtown. There are always people parked along the curb lane so it will be interesting to see what happens if someone tries to stop and block the one working lane in each direction. Celebration Park in the Green Room looks like Paul Bunyan and Blue the Ox had chopped down a forest beside a beach. Re: cars stopping to park and blocking vehicular traffic. 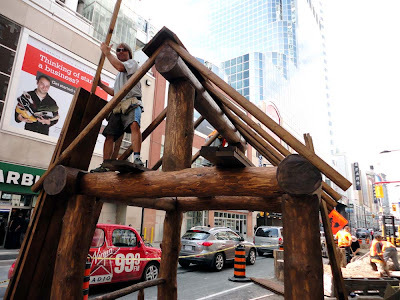 There are lay-by's created between the patios etc., during the course of the event. This is to allow trucks to stop and do deliveries without disrupting traffic. 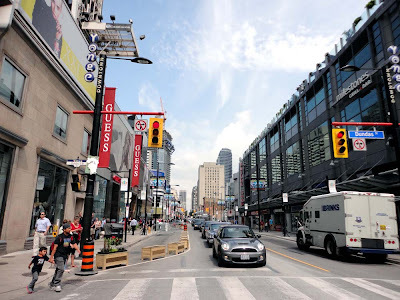 So far, traffic doesn't look any worse on Yonge Street since setup started so that's an added bonus to creating the much-needed extra pedestrian space. This makes sense since Yonge Street in this area has much lower vehicle counts than comparable streets in the downtown core.